Pappé's scholarship on the issue has been subject to severe criticism. Benny Morris says that Pappé's research is flecked with inaccuracies and characterized by distortions.Ephraim Karsh refers to Pappé's assertion of a master plan by Jews to expel Arabs, as contrived. ^ Pedahzur, Ami; Perliger, Arie (2010). "The Consequences of Counterterrorist Policies in Israel". In Crenshaw, Martha. The Consequences of Counterterrorism. New York: Russell Sage Foundation. p. 356. ISBN 978-0-87154-073-7. Retrieved 25 January 2011. ^ Karsh, Efraim. 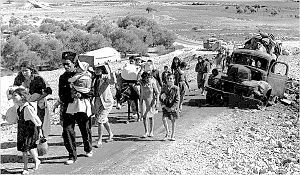 "Were the Palestinians Expelled?" (PDF). "Commentary". Archived from the original (PDF) on 24 February 2014. Retrieved 2014-08-06. ^ Karsh, Efraim (June 1996). "Rewriting Israel's History". "The Middle East Quarterly". Retrieved 2014-08-10. ^ Anderson, Perry (November–December 2015). "The House of Zion". New Left Review (96). Retrieved 15 September 2016.